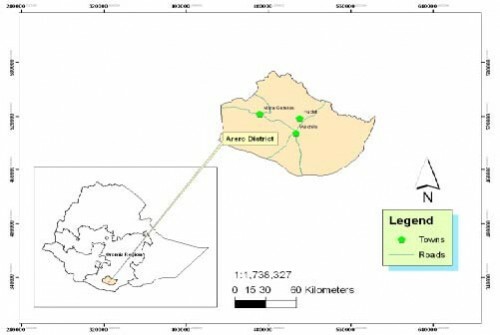 Accelerated human population growth mostly coupled with poverty has enhanced negative impacts on forest resources in Ethiopia.This study aims to assess the vegetation structure, composition, and plant species diversity and regeneration status of Arero dry Afromontane forest. Concentric circular plots of 1m, 3m and 10m radius were used for recording seedling, sapling and tree species respectively. As the result, 84 species that belong to 44 families were recorded in the forest. The Shannon-Wiener diversity indices and evenness of woody species were H’=2.67 and J’=0.79 respectively. The total density and abundance of woody species were 272 stems ha per hectare and 427 individuals per all of the sampled plots. The forest is floristically diverse and rich as compared to many similar forests in Ethiopia. The structural analyses of the population of some dominant species experience poor regeneration. This implies that current management practices are not satisfactory to sustain forest conditions. Fig. : Map of the study area.